The Chardonnays crafted by Sonoma visionary Mark Aubert leave most collectors nearly speechless with desire. I don't know many great winemakers much inclined to false modesty. And Mark Aubert, who is the hottest Chardonnay producer in California right now, is no exception. Aubert's belief in his abilities and in the quality of his wines is unmistakably clear. And he's just as clear about the deficiencies of other Chardonnays, no matter how vaunted their reputations. "Okay, but a little pedestrian," is a typical response when Aubert is asked his thoughts on a competing wine. And yet, when I dined with Mark and his wife, Teresa, at Redd restaurant in Napa not long ago, I sensed his discomfort when his own wine outshone another highly regarded Chardonnay: the 1999 Domaine Leflaive Puligny-Montrachet Les Pucelles, a Burgundy with a lofty reputation and an equally lofty price ($400) on the wine list. Aubert has a soft spot for Domaine Leflaive and what he calls its "fanatical upbringing of vines." But on this particular evening, the Leflaive remained deep in the shadow of Aubert's own 2001 Aubert Ritchie Vineyard bottling. Ritchie is one of four Chardonnays (the others are Lauren, Reuling and Quarry) that Aubert sources from the cool Sonoma Coast region. The Ritchie was full-bodied yet not excessive, tightly knit but not uptight, and brimming with an array of complex flavors that ranged from lush fruit to steely minerality. As the meal progressed, I noticed that Aubert's Chardonnay grew more and more lively and more expressive. By the end, my glass of Leflaive remained half full while I drained the last drops of the Aubert Chardonnay. Park B. Smith, a collector with one of the greatest wine cellars in this country and a passionate Aubert fan, wasn't surprised when I described my Aubert experience to him. Smith recalled a time he'd accidentally left an unfinished magnum of Aubert Chardonnay in his kitchen overnight without recorking the bottle. Though this might well have turned the wine sharp, instead, as Smith recalled, "The next day, it still had so damn much stuffing! "—an allusion to the wine's rich fruit and substantial structure. Another collector, John Green, also had an Aubert story to tell: "Before the Aubert, I'd never served my friends a white wine that they'd liked enough to ask me to get more of it for them. Red wines, yes, but never a white wine until Mark's Chardonnays." Alas, for anyone who isn't already on the Aubert mailing list, it's hard to acquire one of these Chardonnays. Not a single bottle of the Aubert winery's 4,000-case annual production is sold to wine stores. And the few shops that do offer Aubert wines—having apparently obtained them on the "gray" market—charge double or triple the mailing list price of $65 to $70 per bottle. Because, as Aubert says, "We don't do winemaker dinners or road shows," the only way to taste his wines is by ordering them at one of the few restaurants, such as Napa Valley's French Laundry and New York City's Le Bernardin, that have managed to purchase a few cases. As far as getting a spot on the mailing list, well, it could be a matter of three years before you are "invited" to buy a bottle. Mark Aubert grew up in wine country, in the small Napa Valley town of St. Helena, where his father was the local pharmacist. But his parents also own a vineyard in St. Helena, planted to Cabernet Sauvignon, and they were the ones who introduced Aubert to wine. He recalls, "As a teenager, I was allowed to pick out bottles from their cellar so long as I didn't drink and drive. While other kids were drinking beer, I was sipping Champagne." Aubert was also drawn to the vineyards. 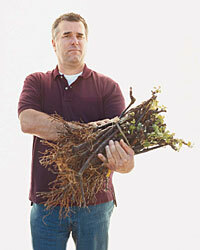 In fact, he spent a great deal of time among the vines. Or as Aubert describes it, "We rode horses in vineyards, we shot guns in vineyards and we caroused in vineyards." His parents had wanted Aubert to become an electrical engineer but, according to him, this was never a real possibility. As he puts it, "I'd have lost my sense of self-worth if I'd done that." Instead, he got an enology degree from Fresno State in 1985 and soon after graduating was appointed assistant winemaker at the Monticello Cellars in Napa, where he had a hand in making a splendid, old-vine Chardonnay called Corley Reserve. Aubert was also a member of three different wine-tasting groups, including one that met one evening a month at a local wine shop owned by the husband of the legendary winemaker Helen Turley. At the time, Turley was producing state-of-the-art Chardonnays at Peter Michael Winery in Knights Valley. She and Aubert struck up a friendship. "I was eager to learn, and Helen coached me on many things," says Aubert. "And she was also impressed by what we were doing at Monticello." In fact, Turley was so impressed she hired Aubert to be her assistant winemaker at Peter Michael in 1989. "Helen's candor was such that when she called me, she said she hadn't spoken to anyone else about the job," Aubert recalls. He was excited because he not only got to work closely with one of the winemakers he admired most but also with one who shared a similar sensibility. "Helen was a huge Francophile—as attuned to Burgundy as Bordeaux," he says. "She was able to coax incredible aromatics out of her Chardonnays. I just fell in love with the wines that she was making." And Aubert was also inspired by Turley's natural winemaking techniques. "Helen had the courage to just let it happen, let it go." About six months after hiring Aubert, Turley abruptly left Peter Michael to embark on her own project, and later to the then-brand-new Colgin winery, where she proceeded to turn out some of the most sought-after Cabernets in Napa. Aubert, in turn, was named head winemaker at Peter Michael, where he continued to turn out exemplary Chardonnays. He was only 28 years old. A few years later, Turley departed from Colgin and once more Aubert was named as her replacement. His Colgin wines are wildly sought-after and have received great accolades. And yet although he makes acclaimed wines, both red and white, his tenderest touch has always been for Chardonnay. Or as Aubert says, "Chardonnay has always been the grape that gets me out of bed in the morning." By 1999 he was ready to make his own wines. "I'd gained knowledge of great vineyards," he recalls, "and I knew what to do with them for other wineries, so I thought, why not do something for myself?" There were obstacles. For one thing, unlike the owners of Peter Michael and Colgin wineries, he was not wealthy. Still, Aubert was able to get a $50,000 start-up loan collateralized only by his considerable reputation. The then-unsung Ritchie Vineyard, near Forestville in Sonoma, was the source of the first Aubert Chardonnay; the first vintage was 2000. Other winemakers followed. According to Aubert, "Four or five great winemakers now make Chardonnay from Ritchie fruit, but I believe we've reserved the best three blocks." A few years later Aubert "begged, borrowed and stole," he says, to buy his first vineyard, near Ritchie and adjacent to a cemetery. He named it for his daughter Lauren, born in 2001. "I believe in harvesting incredibly small crops—half or less what a normal vineyard produces," says Aubert, when asked to explain the secret to his considerable success. "That's what produces explosive flavors." And much of the credit for this, says Aubert, belongs to Ulises Valdez, his vineyard manager and viticultural partner. At the age of 16, Valdez forded a neck-high river to slip across the border from Mexico. Now 37 years old and a U.S. citizen, Valdez remembers his fellow passengers staring at his still-soaked clothing as he boarded a flight for San Francisco, where his brother awaited him. Today Valdez owns both a vineyard-management firm and vineyards, including the UV Vineyard from which Aubert sources Pinot Noir. Valdez and Aubert recently leased a rolling, 30-acre Sonoma Coast vineyard together, where Aubert planted Chardonnay and Pinot Noir, and this year Valdez released the first vintages of his own wines. Aubert, openly admiring of Valdez's efforts, notes, "I've watched Ulises progress from grape grower to fine-wine grower." The two share an easy camaraderie. Removing rogue shoots from vines in Lauren's Vineyard one morning, Aubert paused and, turning to Valdez, said, "Patrón, one day my daughter will bring her own kids here." "Amigo, that's something I'm always dreaming for her," said Valdez. "Of course, I don't pay for my dreams." Aubert's own dream of building a winery is, so far, unpaid for. At harvest time, refrigerated trucks race his grapes to Laird Family Estate Winery, a custom crush facility in Napa. The smell of newly harvested Chardonnay is, according to Aubert, practically overwhelming. "You slide open the truck's rear door and the smells are hypnotic—quince, citrus, dried apricot, all the aromatics that have been trapped inside." Aubert makes, bottles and cellars his wines at Laird. The morning Aubert and I tasted samples of his 2004 vintage wines at Laird, I was struck by their appearance in the glass. Instead of the green-gold brilliance typical of youthful Chardonnay, the Aubert wines (the Ritchie in particular) seemed to give off a misty glow, like sunlight filtering through morning fog. When I asked Aubert about this lack of clarity, potentially off-putting, he shrugged and replied, "I'm a firm believer in particulates." Strip these out and the flavor is also stripped out, he affirms. It's a belief that wine critic Robert M. Parker, Jr., would seem to share. He has regularly awarded Aubert Chardonnays some very high marks (including 96 points for both the 2003 and 2004 Ritchie wines) and once described Aubert Chardonnays as "stacked and packed." While her husband makes the wines the world admires, Teresa Aubert's job is to turn most of the world away. Indeed, stationed in her vineyard office on the second floor of their modest Calistoga home, Teresa Aubert spars daily with would-be customers who have not done their time on the Aubert waiting list or, if they have, feel they deserve more wine. Any order that she suspects is destined for a wine shop is rejected. But special situations may gain her sympathy. One customer made a special request for an autographed order of Lauren Vineyard Chardonnay to be opened at a party for his sister-in-law, who had breast cancer. She got the wine, its label signed and adorned with Lauren's artwork. "One customer sends Lauren a homemade pillowcase of the month," says Teresa. "She even made Lauren a quilt." "I try to stay three years ahead of the others," says Aubert of his effort to set the standard for California Chardonnay. He compares winemaking to painting: "My paints are five Chardonnay clones and my canvas is the vintage." Henri Jayer, the legendary Burgundian winemaker, is also a role model. Says Aubert, "I read that Jayer spent a lot of time at his desk studying. The wines he made in the vineyard, he first made in his mind." Aubert's explanation for his success finally comes to this: "The purity you taste in my wines reflects the work I don't put into them," he says. Indeed, only a master knows what not to do with his wine.